"Let's do some gratuitous violence". That's the motto that sums up what you can expect from The Boondock Saints 2: All Saints Day. The original was a surprise hit not in theaters but on DVD in college dorm rooms. It's love of not only movies but also men who stand up and dish out justice as they see fit instantly caught on and over the years has generated a loyal following; enough of a following that the creator of the first movie decided to come back for a sequel. To catch up anyone who hasn't seen the first film, two brothers of Irish decent (Connor and Murphy) who live in Boston, realize that they are on a mission from God to wipe out the criminal element in the city. Instead of donning costumes and leaping from rooftops these boys decide to just hand out their style of justice using mans ultimate creation: guns. The sequel picks up a few years later with the boys living on a sheep farm in Ireland with their father. The shooting of a priest back in Beantown draws them out of hiding and along the way they pick up a Mexican by the name of Romeo who becomes their ear on the streets/partner in crime. As usual Connor and Murphy dive head first into the old habits with guns blazing and something resembling a plan of attack. Along the way we discover that the hit on the priest wasn't just a random act of violence or a message to the saints. There is another story here and it goes back to before they were born. The sequel looks a lot like the first movie. The same sense of humor that was apparent in the original is just as obvious here. We see the retelling of each hit the saints make from the perspective of the FBI agent assigned to the case. There is a sense of not only drama but also style to the way they depict the violent acts. As you watch a part of you does wish that you could simply walk into a group of criminals and get away as smoothly as the saints do. Alas with a movie like this the one draw back is that it almost comes a little too silly. Even though the humor that is brought to each scene the saints are in is enjoyable, it's hard to take it completely seriously. You almost feel like you are watching a comedy at times. There is no real sense of a threat at any time. These guys are essentially walking into a world of crime and yet you never get the sense that they are in over their heads. In the real world it is highly unlikely that anyone who attempted what they do in this movie would even make it out alive. But perhaps that's the strength as well as the weakness to a movie like this. During certain parts of the movie you want the saints to glide through every encounter without a scratch or consequence. At others you wish they would have some sort of setback. In the end though, you can't but be pleased. The Boondock Saints is a movie for people who love action movies, who love to see the good guys win, and deep down, sometimes wish they could be as tough as these guys appear to be. Download The Boondock Saints II: All Saints Day from the iTunes Store in Digial HD. 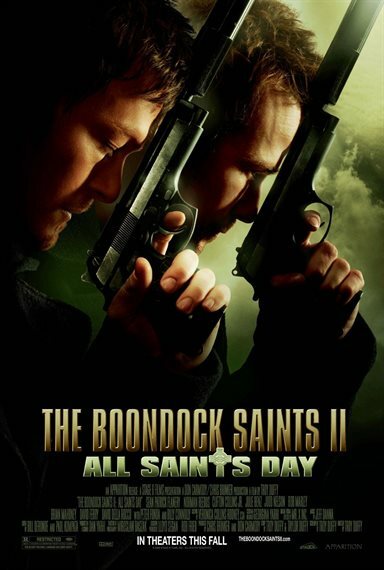 For more information about The Boondock Saints II: All Saints Day visit the FlickDirect Movie Database. When Chris was but a wee lad growing up in the slums of suburban New Jersey, he happened to rent a little movie called Tron. Then his head exploded. It was at the moment that he realized that he loved movies, and since then Chris has made it a habit of renting movies, going to the movies, discussing his favorite movies, and anything else in between when it comes to that genre. Read more reviews and content by Chris Rebholz.